Once again we were privileged to join the Alpine meet of the Alpine Club, Climbers' Club, FRCC and the Wayfarers'. 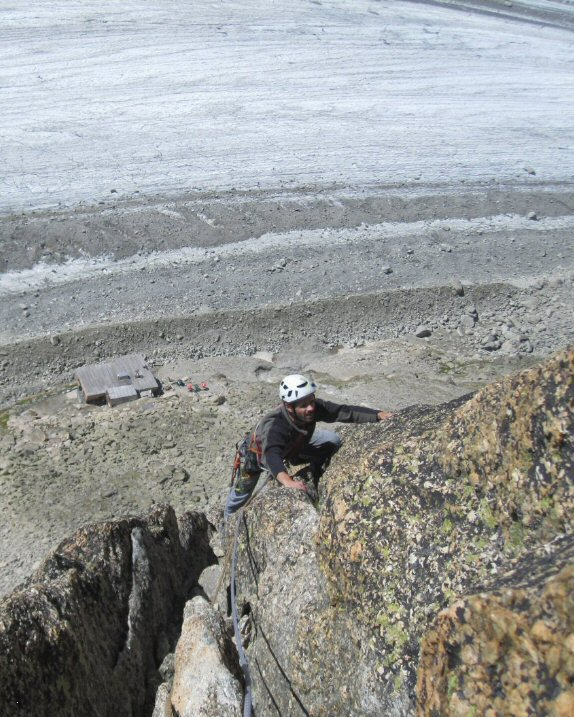 Ken Fyles and Helder Machado were first to arrive at a very hot Chamonix (37 degrees). It had been hot for six weeks and the snow routes were in very unstable condition. All routes to Mont Blanc and most of the 4000+ metre peaks were closed as were some of the lesser peaks such as the Chardonnet. Ken and Helder's first route started from the Albert Premier Hut to the summit of the Aiguille de Tour (3544 metres). This was a good route choice yielding glaciers and snow in reasonable condition and a fine scramble to the summit of the Tour. Temperatures dropped in the valley and the weather became unstable giving several rainy days. Our next big trip was to the Argentierre hut with the aim of doing a new rock climb behind the hut called "Gateau de Riz". We had no guide to get to the hut but we were advised it was easy - just take the two cable cars to the "Grand Montet" and walk down towards the Argentierre Glacier and cross it to the hut. Simple but when we reached the cable car station we found the upper cable car was closed due to high wind. What to do? We took the first cable car then notice footpath signs to the Argentierre Hut. The path led to the lower part of the Argentierre Glacier. Not knowing what to do, we started to walk up the glacier. Then we spotted a large group in the middle of the glacier walking at a quick pace. What luck, they must be going to the Argentierre hut, so we followed. Just by the start of large crevasses they stopped for lunch so we continued getting increasingly lost in the maze of ice and crevasses. Then we looked down to see that the large team we'd followed weren't going to the hut at all but had gone to the part of the glacier with the most crevasses to practice crevasse rescue techniques! What to do - the ascent through the maze of crevasses had become impossible. So we decided to descend and traverse all the way across the glacier hoping to find a point where we could cross the bergschrund onto solid rock. It wasn't easy but we finally got the chance to cross to some boiler-plate slabs and climb two rope lengths to a path high above the glacier. This had to be the path from the Grand Montet cable car so we followed it until the glacier became less crevassed and crossed to the hut. It only took us six hours. The following day we started early for our rock climb. Only ten minutes walk from the hut and already in sunshine at 9 am. 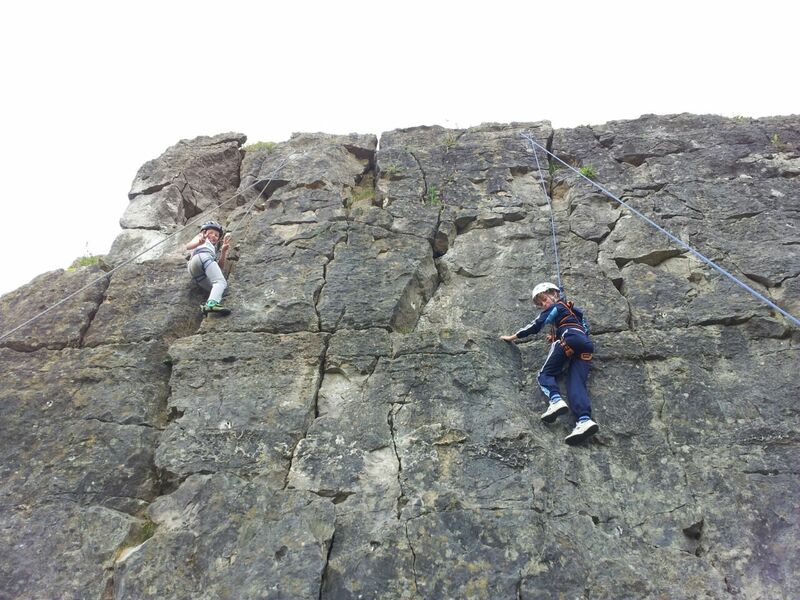 The climb was about 200 metres long and given as 5a (about 4a English grade and well within our capabilities). It was a new route with traditional protection only between belays. It was much harder than expected and the crux called "Lucky Luke Crack" and the slab beyond were a good VS grade. Dave Connelly looks out from the Albert Premier hut. 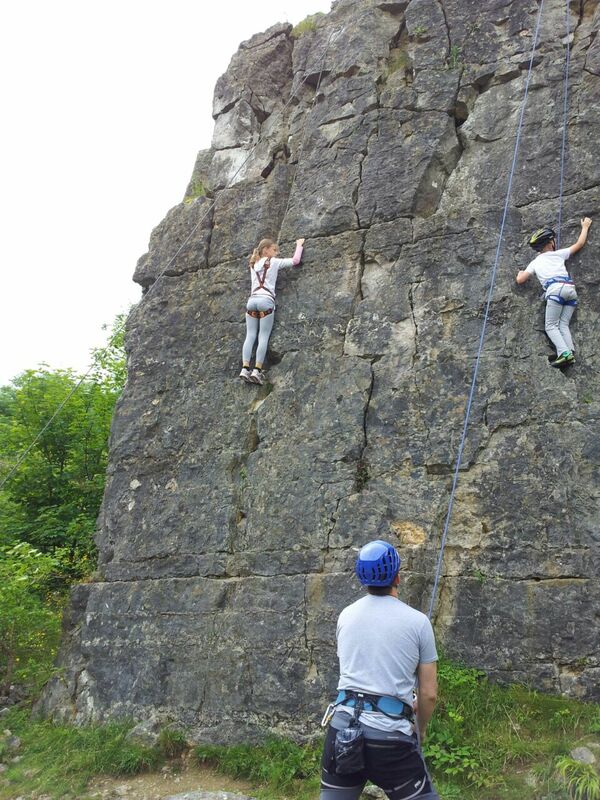 Descent was by a 25 metre abseil, a V. Diff. traverse and a long, unstable rock gully. It was already 4 pm when we reached the hut and we had to get down to the campsite as Helder was leaving the following day. 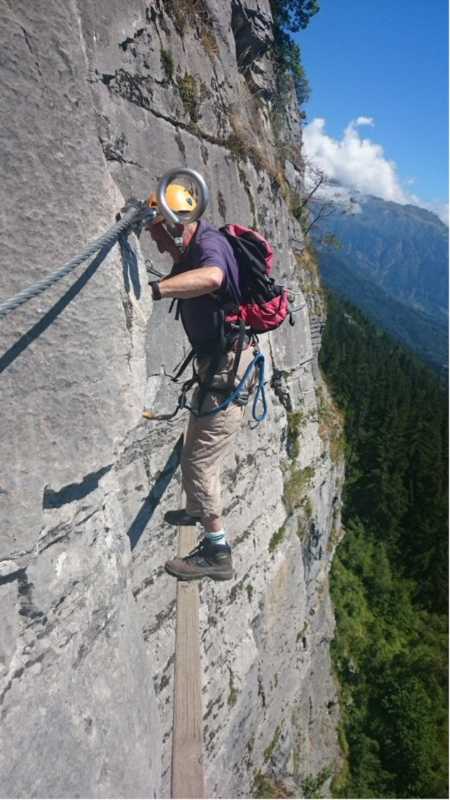 Meanwhile, other St. Helens Mountaineering Club members Dave Connelly and John Hollands were having a very active time on the rock routes of the Aiguille Rouge. In particular they climbed "Modern Times" (5b) and "Gespard" close to the Index. 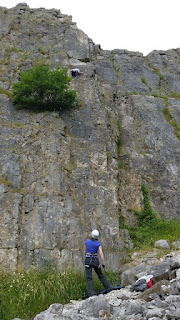 Dave and John then took to the modern climbing of via ferrata. 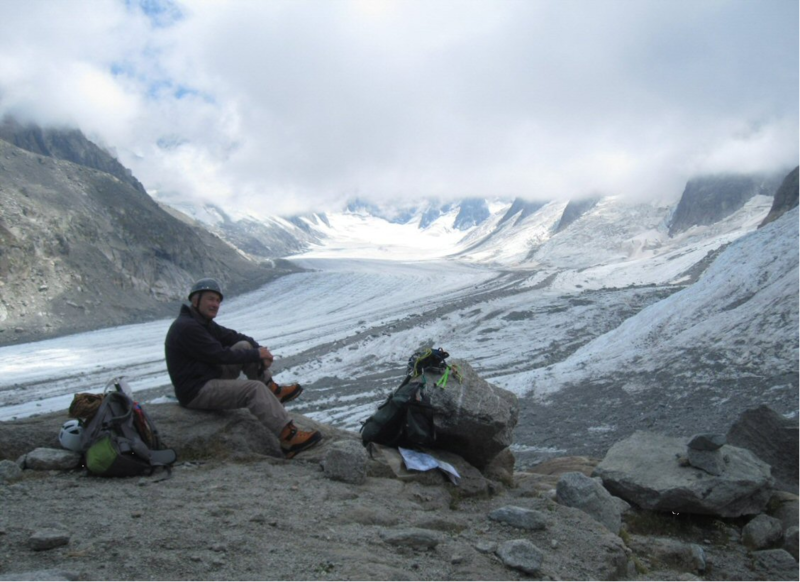 Dave also teamed up with Wayfarer Terry Kenny to climb Tete Blanche (3429 metres) from the Albert Premier Hut. 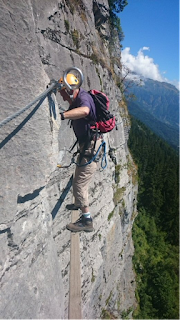 The six weeks of extremely high temperatures in the Alps resulted in the strangest climbing season ever but at least by grouping with the Alpine Club and others we were always able to get first hand information and make the best of it. PS Dave had the most luxurious tent on the campsite with blow up armchairs and sofa as well as a full kitchen range. That’s the way to do it! Nevertheless, we had a fantastic time. Cornish granite is a joy to climb, and the setting by the big blue Atlantic Ocean is a constant pleasure. 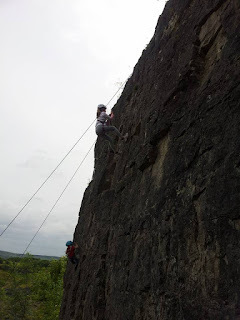 We tackled several classic routes at Bosigran and Chair Ladder, including Diocese and Little Brown Jug, both VS 5a, at the top end of the grade, and (more importantly) absolutely ace. John spent a day continually stating he didn’t want to lead anything too hard before going off-route and leading VS anyway. All the while I dealt with the classic mind game of being certain you aren’t going to tackle something, until you realise you are halfway through doing it and there’s no going back. On the final day we relaxed in the sun on one of the country’s best V.Diffs, Commando Ridge, a 200-metre alpine-style pinnacle ridge that just happens to be by the sea. A great end to a holiday that started with a gloomy but rewarding stop-off in Bristol for a Classic Rock tick. Saturday was given the better weather forecast so Chris Manasseh, Hannah Carrington, Yvonne Parr had opted to climb at Shepherd's Crag. Ken Fyles and Jeff Dodwell preferred a bigger mountain route and set off to scramble on Gillercombe Buttress followed by a walk up Green Gable. Drizzle greeted us on the Sunday. It was time to do the planned BBQ walk up Hall Fell Ridge. Parking in Threlkeld we walked up to the start path. It was closed due to the risk of a nearby dam wall collapsing. A local by the gate said it had been like that for years but didn't advise contravening the notice. When she learned we were planning to climb "Hall Fell Ridge" she was appalled saying it was a dangerous route particularly in the rainy conditions. Ken thought she was exaggerating so the lady pointed us to an alternative start path. 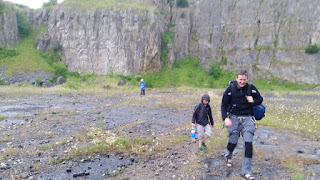 Just as we met the scrambling about half way up ridge, the rain stopped but even so the rock was wet and slippery. This ridge is a joy, never very serious as easy alternatives are always easy to find and the hand holds are good. We followed the ridge right to the summit where the weather cleared just in time for lunch. 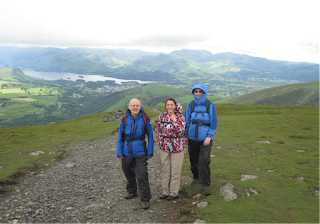 The descent was by the long ridge of Saddleback but Yvonne and Jeff wanted to pause at the summit for a while to take in the wonderful views. 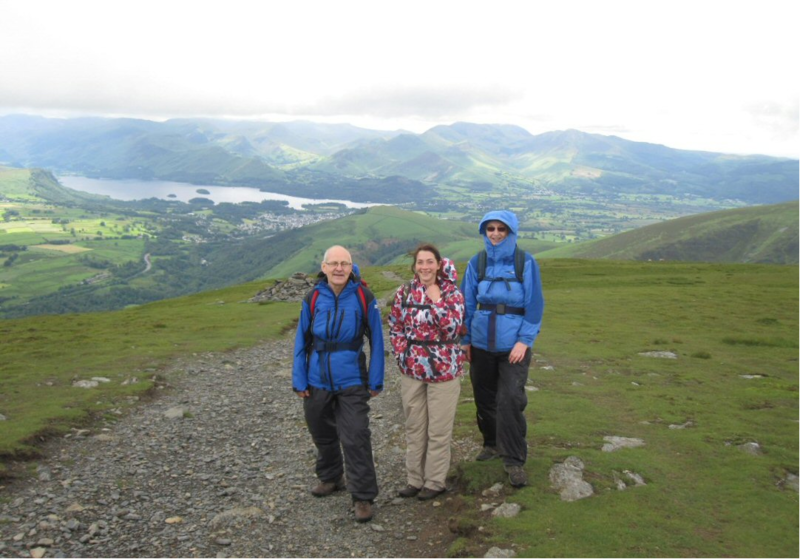 Hannah on her first real mountain walk was amazed to see the Solway firth under the clouds and to the west Thirlmere, Derwentwater and our own hut area. The weak sunshine on the descent ended a perfect day. Following the meet at Langdale a conversation about putting together a climbing session for those younger affiliates of the club, who may be future club members. 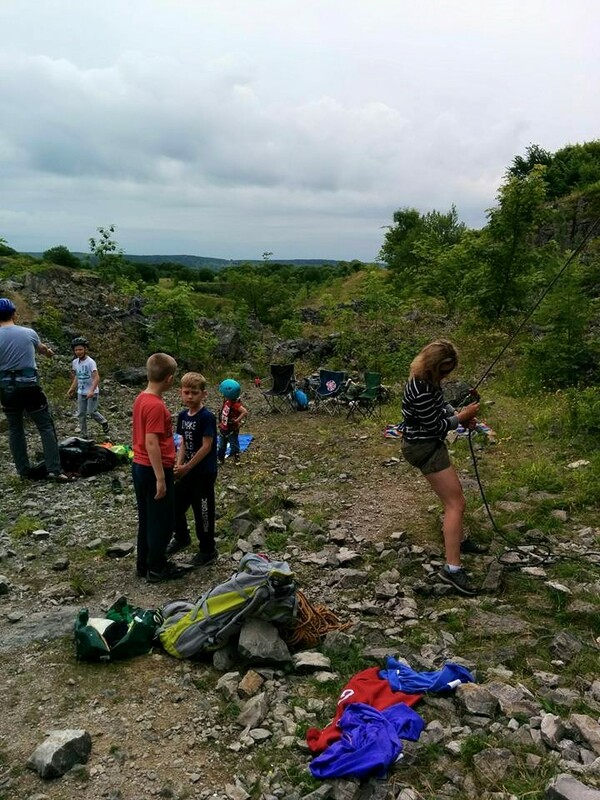 Alice Mason and Simon Chriscoli organised a simple meet at Horseshoe Quarry, Stoney Middleton, with a view to getting the children onto the rock. The location was chosen for its variety of simple grade climbs and with the location being a sport climbing location, the setup for top ropes was simple with very little equipment required. For those with families, part of the fun is ensuring that sufficient supplies are provided for all involved, including food, drink, chairs, etc. However Alice learned to her detriment this meant there was either no room for, or she had forgotton her rock boots. So it was barefoot on the rock for her. Ropes were quickly setup on two "simple" routes, Luke Skywalker and Saturns Rings. Much to our chargrin, the kids for whom these routes were setup seemed to be more interested in scrambling around and over the variety of boulders placed locally. 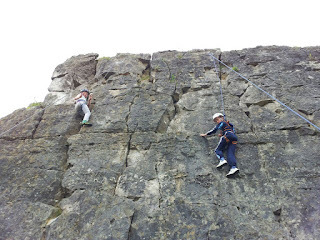 However, interest started to be piqued and the climbing commenced with some of the children taking their first experience on the rock. It did turn out that both Luke Skywalker and Saturns rings, proved quite tricky for some of the smaller children, we then turned to top rope Minnie and Goofy, grade 3 climbs. 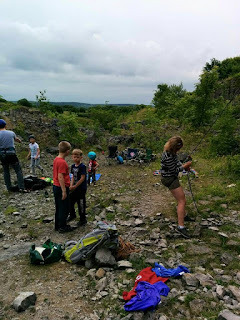 After the children had burned out, either climbing vertically or across the multitude of rocks and boulders, it was time for the adults to have a go. Yvonne Parr joined us for the last part of the day, and we moved onto Trogg a 2 pitch (4,5) but with intention to do the first pitch, as the weather was starting to close in. Simon led, with both Yvonne and Alice also getting some time on the rock. After Alice tried to kill me by dislodging a significant chunk of wall, the heavens decided to open, so it was a quick packup and sprint to the cars. Simon leading Trogg (4), Yvonne belay. Simon & Luca, with Yvonne bring up the rear as the heavens opened. On the family meet were; Alice Mason with Emma (3) and Joseph (5), Pavla with Filip (10) and Amelia (12), Tereza with Filip (7) and Adam (9), Simon Chriscoli with Luca (7), Yvonne Parr. All the kids were well behaved and friendships were quickly established.